A militant Islamist movement has claimed responsibility for Monday's attack on a satellite communications centre in Maadi, posting a video online alleging to show part of the operation. The Furqan Brigades announced on Tuesday that it was behind the attack, which took place in the upper class district of Maadi, south-central of the Egyptian capital. The previously-unknown group has recently claimed responsibility for two other attacks, including one targeting the Suez Canal in September. In the video, the self-proclaimed jihadi group describes Monday's strike as part of an ongoing war between "Sunni muslims and infidels who intend to uproot Islam from the land of Egypt." With an Islam-themed song playing in the background, the video opens outside the satellite centre in the early morning of the attack. Two alleged militants lurk nearby. In a later scene, several flashes follow, which the group says were caused by the rocket-propelled grenade (RPG) they fired. The grenade left a hole in one dish, however communications were not disrupted. During after night curfew, there is usually a military check-point less than half a kilometre away from the satellite communications centre. In the video, the Furqan Brigades – who posted a similar video after the Suez Canal attack – called for an offensive against the military, describing them as "infidels" unworthy of mercy. 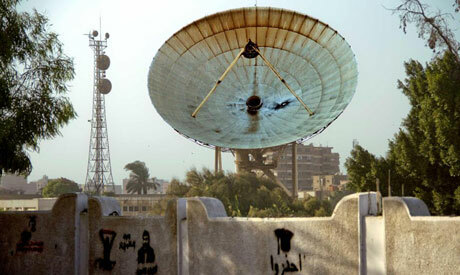 The satellite attack marks the second time a RPG was used during militant strikes in Cairo. The first was against a police station in Kerdasa in mid-August. RPG attacks are more common in the Sinai Peninsula, where Islamist militants are more abundant and clashes with security forces are especially violent. Clashes between Islamists and security forces have increased since the ouster of Islamist president Mohamed Morsi on 3 July. Hundreds have been killed over the past three months as a result of these clashes, with the majority of the dead coming from the Islamist camp. Where is the intelligence that would have preempted this and other disturbing 6th of Oct terror acts? Where is the quick justice that would set a price for those open unchallenged criminal acts? Where are the preemptive security interventions that could have saved the very lives of the security personnel themselves? Where are the strong determined hands??? ?